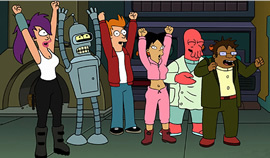 Futurama was cancelled after four seasons on the FOX network. But, because of the popularity of the show in syndication and on DVD, the characters were revived for four made-for-DVD movies. They’ve been broken up and are currently airing as a fifth season on Comedy Central. Though the last installment provides some closure for the characters, series creator Matt Groening says the door was purposely left open for future exploits. Would you like to see Fry and his friends return for more space-age adventures? If so, let the execs know. There are a few things you can do. Tell your friends and family members to tune in and watch the series on Comedy Central. If that’s not possible, encourage them to watch online. Maybe one of them is secretly a “Nielsen family” or knows one. If possible, buy the DVDs and encourage your local rental store to do the same. Disc sales were a big factor in the show being revived the first time. Write to Fox and Comedy Central. Let them know how you feel but, keep it civil. Everyone responds best to courtesy. Sign the petition below and let the execs know you’ve signed it. Spread the word and ask others to do the same. We, the undersigned, have faithfully watched and enjoyed the Futurama TV show and movies. They are outrageous, irreverent, inventive, and hilarious — all of the qualities that one could want in an animated series. We ask that you please continue producing new installments of Fry, Bender, and the rest — in made-for-DVD movies, new episodes, or better yet, both. The sales of Futurama DVDs have proven that we, as an audience, financially support this enjoyable show and are ready for more. Please take advantage of this opportunity and produce additional installments. Please bring back Futurama! The Simpsons is terrible from season 1 to 28! I can tell it will stay garbage. We need a good animated comedy show, and from 1999 to 2013 we had one. The best one there ever was. Please bring the show back it was so Mugh better than garbage out on tv today! I am a 19 year old Business Administration major in Massachusetts. I love this show and watch this show every night. I find comfort in Futurama and often fall asleep after watching multiple episodes nightly. I love this show and need it to come back. Please. I want the show back, maybe some how after going back to the beginning of the episode fry would remember what really happens to his watch because of his unique brain structure. And then he'll wait for leela so they end up marrying. Thus continuing the show as if "meanwhile" never happened. Best show ever since the Simpson way better than family guy or Rick and north so why not? Please bring back Futurama! I watch every episode of every season on Netflix literally every night and I'd gladly pay triple my Netflix subscription and/or triple the price of a box set of DVDs to watch new episodes. I'd tune in every week to whichever network it would be on too. My wife and I love this show and can't get enough of it. Best show ever!! Come back Futurama!! Return to the world of tomorrow!!! Futurama is a wonderful show. At every turn there is something new for the audience. Please bring back this show! Love the show. I will wait longer than Fry's dog for it to return. I miss this show very much! It's characters , storylines everything worked so well! It was a show that made you laugh as well as cry and it's one of the best shows ever! Please please bring it back! This show, there are absolutely no words to describe the majestic work of art that is Futurama. I was absolutely devastated when Futurama ended, there is just so much "What if?" left. I don't know what I'll do if this show is not brought back. Even if it's just movies. I want, no NEED to see the constantly developing relationship of Fry and Leila. One of the greatest shows ever made! I freaking love this show! Please bring it back! Please bring back the show. Image courtesy 20th Century Fox Television.